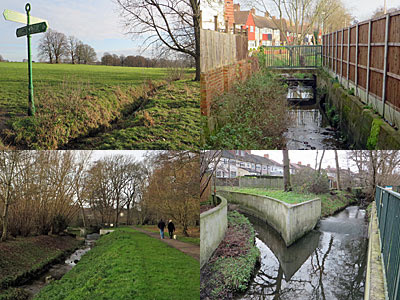 The Shuttle is a minor southeast London river, running approximately due east across the centre of the borough of Bexley. It's almost entirely unlost, a mix of natural channel and concrete culvert, with the added bonus of riverside parkland for most of the way. This makes it relatively easy to follow, aided and abetted by a signed footpath called the Shuttle Riverway which runs from start to finish [map]. Bexley Council even has a dedicated page on their website, and a downloadable leaflet for the walk, and some maps, which is quite frankly excellent. If all London's unlost rivers are this straightforward to track, I'm in for an easy year. The river rises above Avery Hill Park, I discovered... which was a bit annoying because I'd only just visited and had to go almost straight back. The source lies within an unnavigable thicket, from which a deep trench emerges bearing a light trickle, crossed by nipping across a plank to the football pitch on the other side. Section 7 of the Green Chain Walk passes very close by, its intersection with the start of the Shuttle Riverway marked by a trademark green signpost. Disappointingly the Shuttle Riverway immediately ignores the fledgling stream and heads off across the top of the park, past the sights of the Winter Garden, while the river traces a ditch downhill along a line of trees. Also the water disappears, or at least it did on this occasion, which seemed odd, allowing me to stand on the riverbed beneath the next footpath with dry feet. 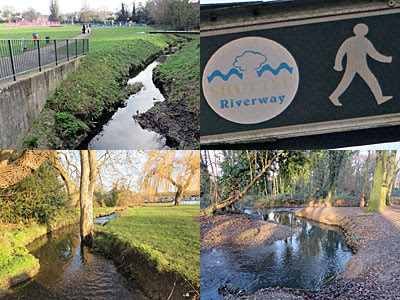 The river, such as it is, promptly disappears in the grounds of the Footscray Rugby Sports & Athletics Club. It's no great loss not to be following around the pitches, but the official footpath is very much elsewhere, making a beeline for some social housing across the park. The flats rise thickly in this southeastern corner of the borough of Greenwich, where the main recreational space appears to be called Do Not Allow Your Dog To Foul This Green. But the route does eventually get back on track, across the Bexley border in Parish Wood, which has a much friendlier natural feel about it. You have to go out of your way to spot the river round the back, but an eco-friendly lake provides a much more pleasant focus, so long as you can ignore the planks and traybake cartons littering its surface. The residents of Berwick Crescent are fortunate enough to have the River Shuttle meandering down a green wedge at the centre of their street. Either that or they live in fear of it flooding, and perhaps overtopping the dozen teeny footbridges that link the two sides together. Nobody lives quite so close for the next mile. Instead three parks have been created on the floodplain, strung out one after the other to create a choice of dogwalking zones. The first is Holywell Wood Park, the majority of its trees lopped to create wartime allotments, but one trunk-packed corner survives. And it's right here that I confirm my year-long river safari will not be 100% completist. The Wyncham Stream swings in from the south after a mile-long run from the Sidcup Bypass, arriving on a sharp bend and flowing into the Shuttle at a reinforced Environment Agency junction with concrete shoals. 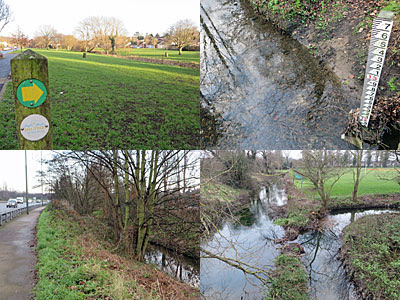 I shan't be walking the Wyncham Stream, sorry, merely pointing out that it exists (and is twice publicly accessible, by the looks of it, should you wish to take a look). Next up, across Willersley Avenue, comes Willersley Park. This is very much the park of choice for children, or it was on my visit, with two fenced off playgrounds for traditional toddlers (blue) and hoop-shoooting teens (pink). Don't worry, the river isn't fenced off too, now a 2m-wide low channel in the grass. Up one end is Cafe de l'Ecole, so named because it's run by students from a local school, allegedly, but it was shut and signless at New Year. Meanwhile park three - Marlborough Park - was pretty much empty, and indeed emptily pretty, with the absence of equipment repelling local families at this inhospitable time of year. But while the footpath tracks the upper heights the river runs behind trees at low level, and that's the last we'll be seeing of it for a while. The Shuttle is then kidnapped by Sidcup Golf Club. It flows beyond the perimeter fence and disappears, creating a splendid water feature (and feeding a large ornamental lake) for the sole benefit of the players beyond. But this means a dull suburban detour... up a footpath, between some garages, and along the sort of nice suburban street where taxi drivers live. One particular peculiarity on Harcourt Avenue is a whopping great pylon in the middle of the street, which must have stood here before the estate was built and so forced the houses to bulge out slightly to leave space for a tiny electric-based traffic island. And it's a steep dip in the contours down to Penhill Bridge which finally reveals the return of the river - even mini streams can carve very obvious valleys. Sheesh, Riverside Park was a bit muddy. Admittedly there was a clue in the name, and also in the green wellies being worn by a local man out walking his dog. Here a long stripe of green follows the Shuttle on either bank, backed onto by the walls of invisible back gardens, before opening out to another Bexley recreational space (are they all pink? why are they all pink?). This is the best stretch of the walk for trees, in particular the brief cut across the corner of Bexley Woods ahead. This is an ancient hornbeam woodland, packed with branching spindly trunks, and also ideal if you're a budding physical geographer. The Shuttle properly meanders here, with erosion clearly seen on the faster outer banks and pebbly deposition in evidence on the slower inner. When naming the next housing estate the planners were right on stream, first with an obvious Riverdale Road, then the more poetic Shuttlemead. The grassy banks are much wider here than they were back at Berwick Crescent, and the residential setting rather more scenic. And then the river disappears again, this time behind rather a lot of allotments, forcing a less enthralling walk along the less appropriately named Love Lane. And as the path and the river finally reach the main road, it's time to leave the official route behind. The council's Riverway wants to take you over the footbridge and up a minor hill before depositing you at the tearooms in the gardens at Hall Place. And that's a beautiful spot at which to end your walk, and highly recommended for a visit, but it's not where the Shuttle actually terminates. Instead the last half mile follows the arterial A2, the Rochester Way, in a channel just short of the westbound carriageway. Behind the trees are the modern buildings of Bexley/Erith Technical High School for Boys, commonly known as BETHS, leading up to the maelstrom of the Black Prince Interchange. Here the Shuttle is at its most concrete, passing in front of the former Black Prince Hotel, now an over-gabled Holiday Inn. And if you continue along the carriageway, which is flanked by an unlikely footpath, you come to the precise point where the Shuttle curves round and flows into the Cray. It joins in parallel, with a brief breach in the divide before the two rivers join as one. They'll wonder what the hell you're looking at, the drivers speeding past at 70mph, but what do they know? One unlost river down, and several more to go.